Drumroll please. Italy has a new tallest building. No wait, maybe it doesn’t. In a country where arguing is a national pastime, a skill Italian Americans have not lost (this video is priceless, makes you wish they were your grandparents), it comes as no surprise that there is an open debate about whether the so-called Cesar Pelli Tower in Milan is, as of three days ago, Italy’s tallest building. The building, destined next year to become the headquarters of banking group UniCredit, is 231 meters if you include the spire put in place this weekend. Italy’s new tallest building, maybe. 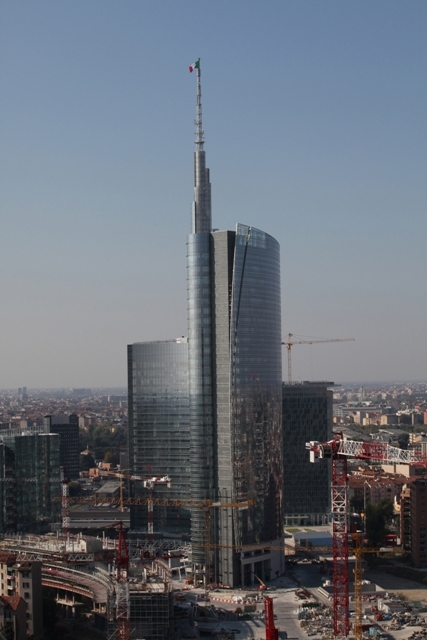 If you don’t count the spire then the nearby Palazzo Lombardia, at 161 meters, comes out ahead of the 146 meters of the Cesar Pelli, also known as the Torre Garibaldi. 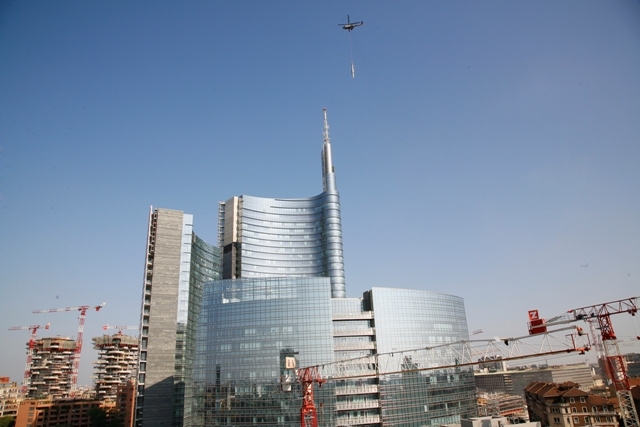 The PR company publicizing the placing of the spire unabashedly announced the arrival of Italy’s tallest building, and then bid to tug at the Italians almost non-existent nationalism by declaring a direct link to Italy’s 150th anniversary this year. The battle as to who is tallest is being fought on many fronts, including on Wikipedia with one page dodging the issue by calling the Cesar Pelli Italy’s tallest “structure”. The question comes down to whether the Cesar Pelli’s spire is an “integral” part of the building. Anyway, tallest or not, the building does have a certain appeal though it has radically changed a part of Milan’s skyline and it’s not a given for the better. Another polemic, but that’s for another time. A few numbers on Milan’s new building: including the spire it’s twice as tall as the city’s famed cathedral and four times as tall as Pisa’s slightly off-center tower; with the spire it ties for 8th as Europe’s tallest building, without the spire it’s an uninspiring 69th. Wow, lucky you. When you get a chance, send me the photo and I’ll add it to this post. Un tizio mi ha spiegato che la misurazione degli edifici è intesa fino all’ultimo piano calpestabile, ecco perchè la Sears Tower di Chicago, per esempio, è identificata nel Guiness dei primati come edificio di 443 metri e non 547. L’antenna in pratica è esclusa, quindi ha ragione Formigoni e, presumo non sarà necessario posizionare una madonnina sopra il nuovo edificio. Per volere di Benito Mussolini infatti la madonnina del Duomo sarebbe dovuta essere il punto più alto della città… Quando il Pirelli ha superato in altezza il Duomo, una copia della madonnina è stata posta sul tetto. Si’ sara’ cosi’ ma mi sa che non e’ universalmente accettato come metodo di misurazione ed e’ per quello che c’e’ la polemica. Pero’ mi viene da pensare che se fossimo in un paese diverso non ci sarebbe la polemica perche’ quello che dici tu sarebbe la regola e non sarebbe aperta a discussioni inutili. Ma che noia! thing thus low in your culture, that it’s not necessarily realised by simply all.